Picture a gathering of thousands of customers where you can showcase your goods and services. Add that to benefit from financial, mentoring, training, sales and media opportunities! 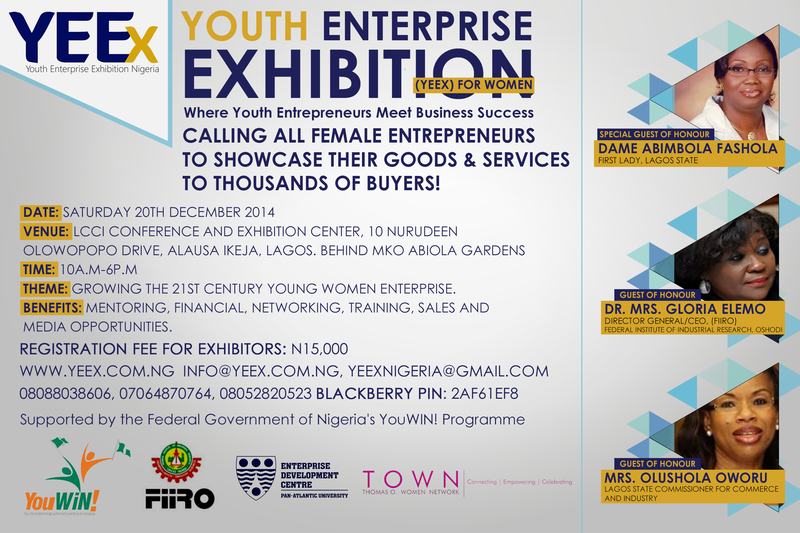 This is what you stand to gain by participating in YEEx For Women 2014 happening on Saturday, 20 December 2014. Youth Enterprise Exhibition (YEEx) Nigeria with the support of Federal Government of Nigeria’s YouWin Programme, Enterprise Development Center of Pan Atlantic University, Federal Institute of Industrial Research, Oshodi (FIIRO) is organising another edition of Youth Enterprise Exhibition (YEEx) Nigeria this December. This edition, tagged ‘YEEx For Women’ is for female entrepreneurs who are either just starting out or have been running their businesses for a while. YEEx For Women is FREE to attend and is open to both men and women. Read more HERE.